Sorry, we are currently sold out of 4-Shot Electric Confetti Launcher. Please check back later. This launcher allows you to remotely fire any of our electronic confetti cannons with DMX, individually or up to 4 at a time! 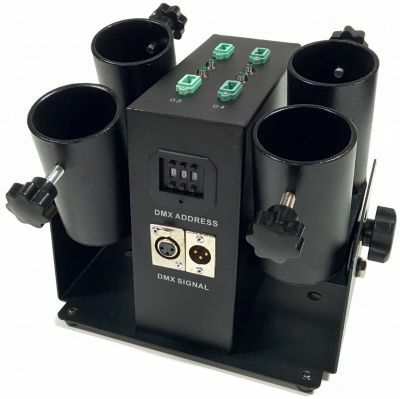 It features an adjustable launch angle for each side, assignable DMX channel, a continuity light to confirm that your cannons are ready to fire, and powerCON power connectors. Each channel has its own DMX address. You just set the address for the first one, and the rest increment from there. So if you set "001" for the unit, then the 4 channels are 1, 2, 3, and 4. We also include a powerCON-to-Edison cable for standard electrical outlets. It's perfect for DJs, churches, and theaters who want to add confetti to their productions!